“Pray without ceasing,” (Thessalonians 5:17) points out the importance of consistency in our prayers. Doing the same thing over and over is what develops habits in our family—whether it is brushing our teeth or praying for the nations to know and follow Jesus. Perhaps you feel outside your comfort zone as you attempt to establish the habit of interceding for the nations in your home. Maybe your parents did not model this while you were growing up and you are not sure how to begin. Be encouraged. There is no set way to pray for the nations. Consider the age of your children. Use your creativity. Try different ideas and re-adjust as necessary. As parents, you will grow along with your children in practicing the habit of interceding for peoples who have no opportunity to hear about Jesus. Make it doable for your family. Start small by praying for the nations once a week. Think about your family’s weekly schedule. Choose a day and time when everyone is home and you are not rushed. Guard this time and keep it consistent. Prayer time for young children should be no longer than 5-8 minutes. Focus on the seven continents, praying for people in each area to have the opportunity to hear about Jesus. Since Antarctica has very few full-time residents, consider replacing this “land of the penguins” with the Middle East. Pray for the same continent once a week for a month, incorporating a new activity each time. Then switch to a new continent. After seven months, start over again. A Bible and a world map are your best tools. If you do not have a world map, download one for free. 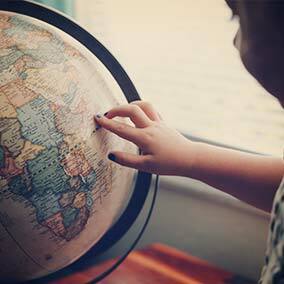 To help young children find the continent names amidst all the words on your map, consider printing the continent names on small cards or pieces of paper. Attach your labels to the map with tape. Pictures of the continent you are focusing on are also helpful. You can check out books from the children’s section of a library or search for photos online. Focusing on God and His purposes first will keep your prayer times rooted in hope. Begin by reading a short Bible verse about God’s heart for the world. Use the same verse for the whole month. Say it in a whisper. Say it loudly. Say it while marching in place. Say it standing back-to-back. Add motions. Soon your children will know the verse by memory. Keep your prayer time active. Think of simple ways to incorporate one of the five senses (see, hear, touch, smell, taste) as well as movement. Be creative. Africa—Locate and touch Africa on your map. Find something to use as a drum, a popular instrument across Africa. Sing a familiar praise song as you play your drums. Pray that the peoples of Africa will have the chance to hear about Jesus. Asia—Locate and touch Asia on your map. Give each person a small serving of cooked rice to eat (Asia eats 90% of rice in the world). Pray that the peoples of Asia will have the chance to hear about Jesus. Australia—Locate and touch Australia on your map. Hop around the room like Australia’s well-known animal, the kangaroo. Pray that the peoples of Australia will have the chance to hear about Jesus. Europe—Locate and touch Europe on your map. Pass a medium-sized ball back and forth with your feet to simulate the popular European sport of football. Pray that the peoples of Europe will have the chance to hear about Jesus. Middle East—Locate and touch the Middle East on your map. Tie towels or pieces of cloth around your heads to simulate the head coverings worn by many Middle Eastern men. Pray that the peoples of the Middle East will have the chance to hear about Jesus. North America—Locate and touch North America on your map. Find a child friendly rock and roll song on your phone and listen to it together (add dance moves if you want). Pray that the peoples of North America will have the chance to hear about Jesus. South America—Locate and touch South America on your map. Count to five in Spanish or Portuguese. Pray that the peoples of South America will have the chance to hear about Jesus. Start small and stay consistent. Author Max Lucado said, “Our prayers may be awkward. Our attempts may be feeble. But since the power of prayer is in the One who hears it and not in the one who says it, our prayers do make a difference.” As you lead your family in faithfully praying for the nations, God will hear your words and begin to answer according to His power. Great ideas and reminders! Thank you!